Donner summit -signature scene for new layout in planning. I am almost finished with the first Tam Valley RR so it is time to start thinking about the next one! 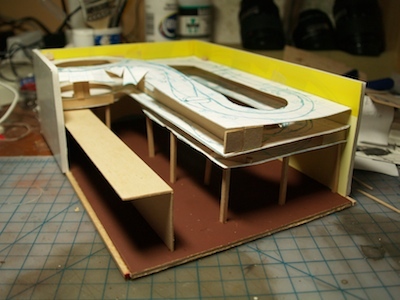 I have a 14' x 20' workshop building out back that would be a great site for a model railroad. 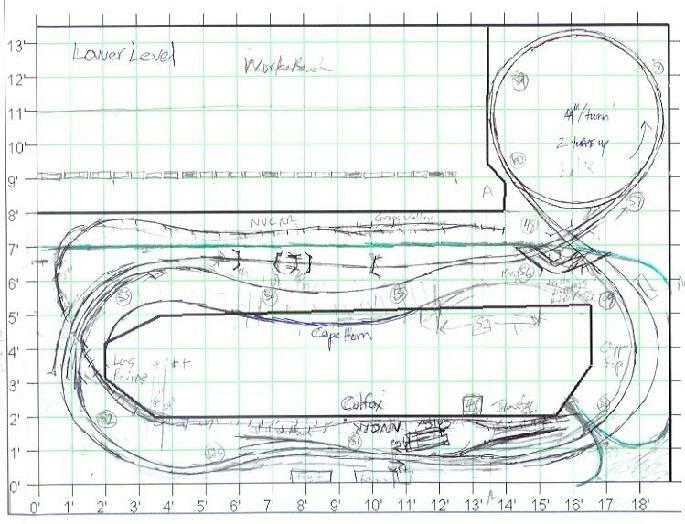 Having the new layout out back would make it a lot easier to have tours of the layout - something I have been thinking about since the since going on the layout tours during the NMRA Anaheim Convention. I don't use the building as a workshop much anymore. The building is mostly being used to store a lot of stuff. I figure that if I build the layout properly, with shelves and cabinets below the layout, most of the storage space can be preserved and even improved . One issue is what to do with my tablesaw. I can't use the tablesaw in the same room as the layout or it will coat the layout with dust. Since, I don't use the tablesaw a lot, I think I will arrange it so I can pull it out and use it outside. Lastly, the new layout will be a good excuse to get the building in to better shape as I have negelected it for the past 15 years and it needs a lot of work if it is going to stay up for another 15 years. The first thing I think of in building a new layout is what will the story of the layout be and what signature scenes will I model to tell this story. The layout plan is the composition that will tie these scenes together. To my mind, a successful layout will have a believable and interesting story behind it. For this layout I want the story to be the moving trains with helpers over Southern Pacific's Donner Summit. I didn't do a proper job of modeling Donner on the current Tam Valley. I compressed the whole experience of Donner into about 8 feet and didn't think enough about a track plan that imitated the real Donner Summit area. I have been doing a lot of research to get ready for planning this next layout including a road trip which I blogged about and making an online Google map of the line including all the timetable of the division and links to photos of the various areas. Staging to represent the rest of the world including the division starting point Roseville. (I thought about modeling Roseville but it is too big to do it in my space and it is just another big yard - boring). Lower foothill area. Red dirt and lots of pine trees. The two tracks wandering separated through the woods. Colfax including the station and an interchange to the Nevada County narrow gauge railroad. 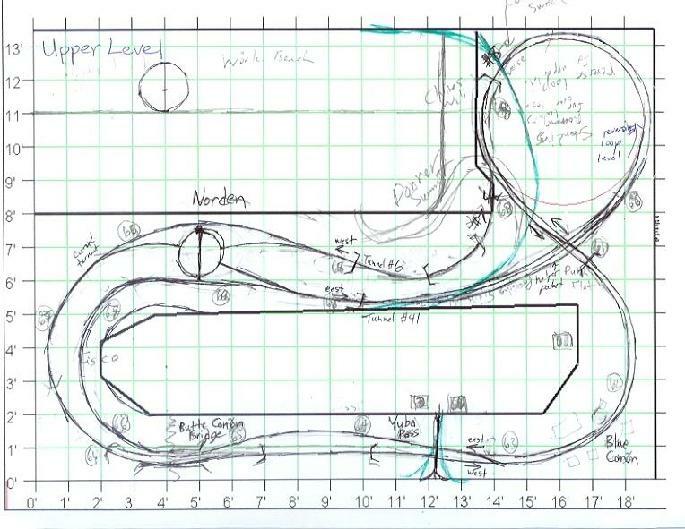 It will be cool to build my first HOn3 track. There will be switching opportunities here for operating interest. Helpers are added here for the push over the summit. Long Ravine bridges with the narrow gauge passing underneath. Cape Horn with a the tunnels and the big drop off with the scenery going to the floor. Magra Road underpass. Nice way to get have the train exit off stage. Dutch Flat mostly because I like the name. It will be a road crossing in the trees. Blue Canon. This small railroad town was inside a turnback loop. Ideal for modeling! Yuba Pass. I have to have my beloved Yuba Pass! Butte Canon Bridge. A cool bridge just visible off the highway. I plan to arrange so I can shoot photos up at it just like the prototype. Cisco. More rocks and trees. Norden with the turntable in the snowshed located between the two tracks. This is going to be where helpers get dropped off and turned around. 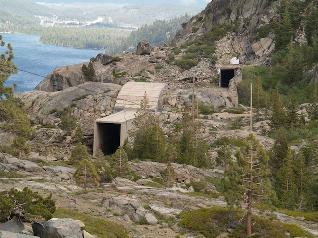 Donner Summit with the tunnels #6, 7 and 8 and the Chinese wall. Tunnel #41. The 10,000 foot tunnel under the summit. Ideal for hiding the upper staging area. Truckee and beyond represented by a return loop with some limited staging. Most trains will go up the hill and return. Not very prototypical, but really simplifies operating and makes it possible for one man to operate effectively. 30" minimum radius, 36" minimum visible radius- I want to operate cab forwards and while they will go around 27" curves they look silly doing it. Double track mainline just like the real SP. In a lot of places the two tracks separate. 20 car trains with 3 diesels on point - this sets the staging yard tracks. For passing I plan to use crossovers on the double track mainline. Multilevel to get all of the scenes in. Double-ended staging on visible lower level. No hidden staging ever again! No stub ended staging where all the trains need to be turned after each operating session! Valence lighting with dalylight compact flourescents. Lots of nicely painted backdrops - no scenes without a good backdrop for photography purposes. Manual finger operated switches except for staging which will use tortoises with routing control. 2.0% maximum grade. 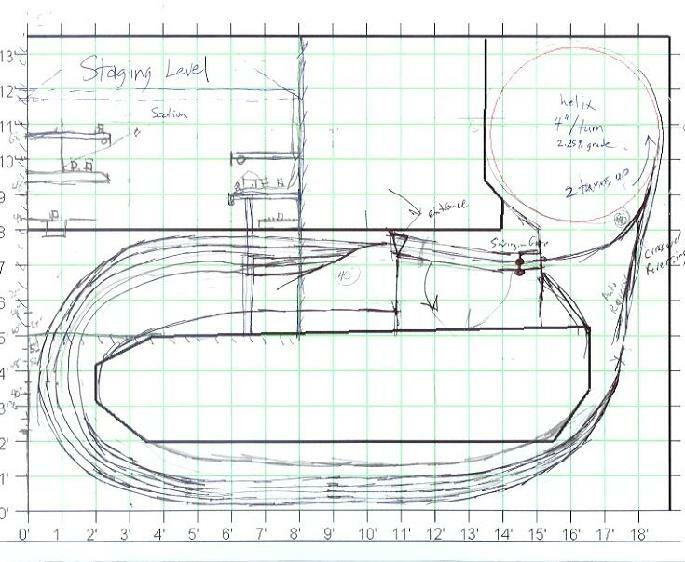 It should be steeper to represent the prototype but that's asking for a lot of trouble with 20-car trains. 30-32" double track helix with 4" rise per turn which works out to 2.1% grade. This is my biggest compromise. I hate helices - they swallow trains and space like black holes but I just couldn't get it to work otherwise. I made a model of the model railroad out of cardboard, foam board and sticks of wood. It allowed me to look over the plan and get a feel for how it will work. I wouldn't do this for a single level layout, but fo a multi-deck I wanted to get some idea of how the decks will interact with each other. I also wanted to see how the summit scene would work. I was really happy about how the summit scene works! It will be the first think visible when people enter the room. From the operating pit you see the trains from the west just like in the prototype picture at the beginning of this article. All the scenes will be visible from the operating pit except fot he narrow gauge extension - although the summit tunnels are on the other side, they are easily visible from the operating pit. This will be perfect. To get in to the pit you must duck under a 52" high deck. I noticed some things I don't like though and I will need to redraw the plan at least one more time. For instance, the deck separation at Colfax is too small. I will need 3 turns on the helix instead of 2. Ugh! 50% more hidden train time! The layout is too wide - I want more room at the workbench. I will add 6 more inches here. Also the decks are too wide at Colfax and Yuba Pass. I am going to make them 16-18" instead of 24". That will give more room in the operating pit. When I get the redesign done, I will post it here.